Compare prices from several car hire companies in Lanzarote and find the best price for car rental. Our prices always include unlimited mileage and insurance. Lanzarote is an island belonging to the Canary Islands and is the island which lies east of the archipelago. The island is located just outside the North African west coast and the main town Arrecife. The population of Lanzarote was measured at approx. 140 000 in 2009. 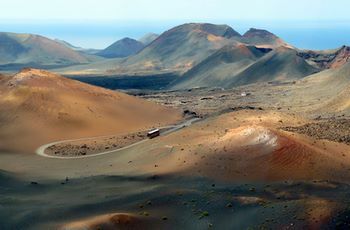 Lanzarote is known to be a popular holiday destination because of its warm climate, the beautiful, long beaches and the unique and contrasting nature. There are very many dead volcanoes here as well as the green volcanic bay of El Golfo. In the north you can visit mysterious caves, while the Timanfaya National Park is located in the northwest. In the park you can visit the restaurant El Diablo, which means “devil”, where food is grilled over volcanic heat. Lanzarote Airport provides international flights and is located about 5 km from Arrecife.